Hi everyone. 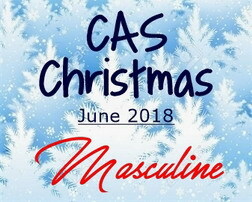 Sharing a QCAS card (as Dolly would say --- quick, clean and simple). I recently bought some Nuvo Glimmer Paste and wanted to give it a try. At the retreat, we spent a morning playing with all different types of mixed media that could be used for snow on cards. This was one of them. I will warn that my first container I received in my order of Nuvo Glimmer Paste was completely dry. I contacted SSS and they contacted Nuvo and a new container was sent to me. The second container is fine, but I have decided I need to use this paste sooner rather than later to avoid the possibility of it drying out before I can use it all. I've added a piece of cling wrap under the lid to help seal as added protection. Oh no, something else to buy, this is so cool, looks like a black tie event. I am so happy that I got to see your glimmer paste IRL, Loll. It is just amazing all the sparkle and glimmer from the paste. So beautiful with the black CS that really makes your snowflakes pop. TFS my friend. Hugs..
Beautiful - such a lovely contrast with the black cs! And thanks for the tip about putting some cling wrap under the lid - I had a jar dry out very quickly. These snowflakes look amazing. As if they were made of tiny ice cream crystals. They look dazzling on a black background !! It is a stunning combo to have that silver paste on black. Thanks for the tip on using the supply sooner rather than later. Sometimes we crafters hoard too long! Wow.. what a stunner! CASilicious :) I have a glass bead gel..I should seal it too, thank you for letting us know. 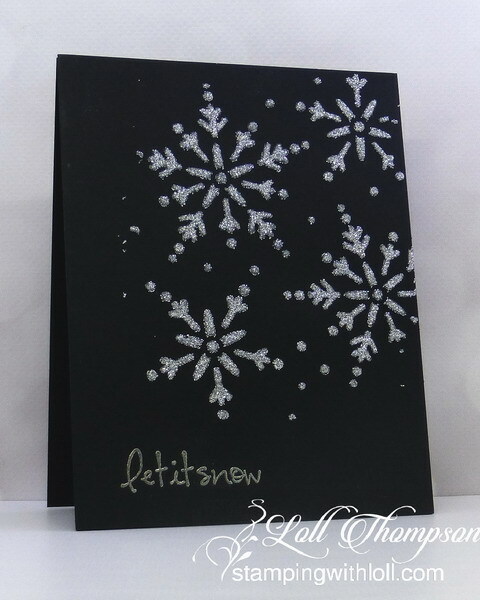 The glimmer stenciled snowflakes are so sparkly and elegant against the black card base, Loll! I love that their white paste showed up so white on the black. I don't have this paste but do have another brand I have not yet tried. Love the results of this one and the simplicity of the design. You are so good at trying new things Loll. The paste leaves great detail. Love the sparkle. This is so shimmery and sparkly. Just lovely. I used cosmic shimmer paste called sparkle on black c/s and it came out sparkly blue! I was real surprised. I've had my Viva Inka Gold has all dried out, both large and small jars. I bought the small jars at a craft fair and when I got home, they were already dried out when I opened them. I have heard using a mix of glycerin and water will re hydrate them. Look at all that glittery goodness! I bet it was fun to lift up the stencil and see the results! That is the second time I heard that about the Nuvo pastes. Good to know to use them rather than save (hoard) them! Your card is beautiful and I'm sure in person it really sparkles. A few years ago, I picked up a bag of several containers of different colored paste and lucky for me none of them have dried up. I rarely use them, but I'm happy I have the option to use them, when I think of them. LOL! Thanks for sharing your experience and the tip. Enjoy your day! Wow! That glimmer paste is gorgeous and putting on the black card is very dramatic and elegant! Perfect for a guy or gal! 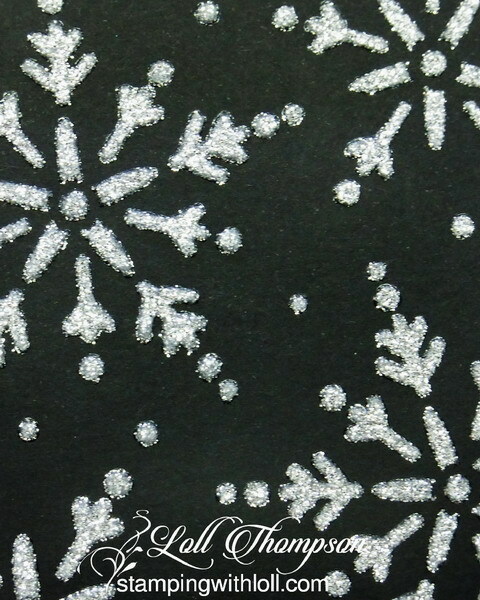 Your sparkly snowflakes look amazing against the black background, Loll! I love the strong contrast and how you included a silver embossed sentiment! 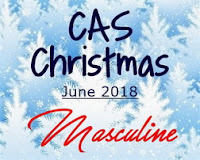 A really fabulous masculine card!